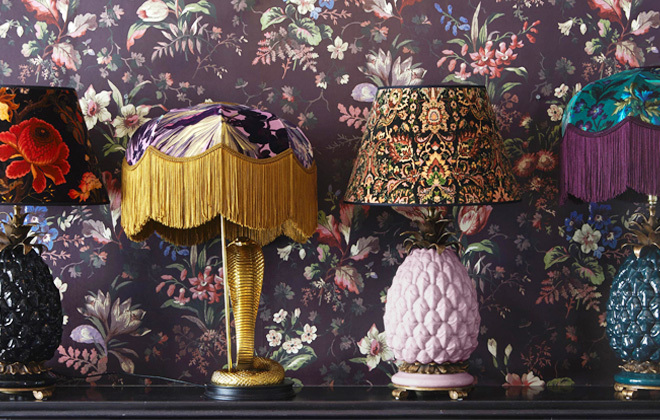 The maximalist in me cannot get over how amazing these prints from House of Hackney are! I am a bit obsessed with textiles in general, but when I came across this fabulous contemporary designer, my obsession grew. Founded in 2010 in an actual house in Hackney, the textile brand was not much more than a dream for husband-and-wife team Javvy M. Royle and Frieda Gormley. Tired of all the constrained minimalism that was so fashionable, they wanted to create a textile company in the grand British tradition, focused on prints that were filled with color and texture, gleaning inspiration from the past, while moving forward into the future. So they set out to create their inaugural collection, which they installed and displayed in their townhouse in Hackney, which functioned as the first showroom for the young company. 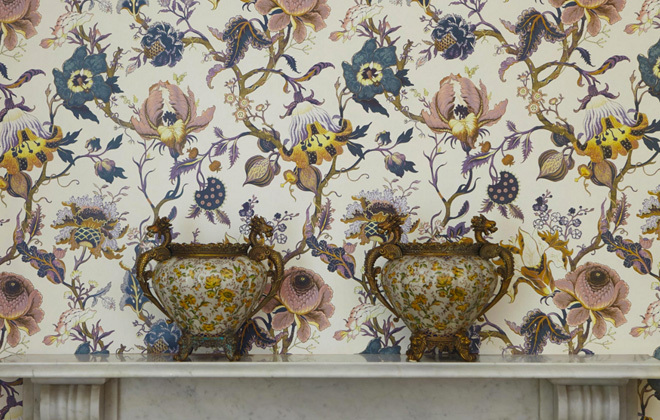 Love how the pattern on the urns works with this wallpaper, don’t you? 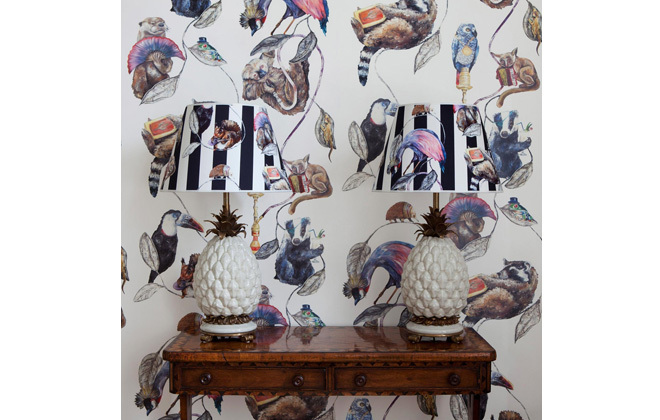 Love the wallpaper but I must admit the lampshades are a bit much for my taste…albeit fun if you liek that kind of thing! And House of Hackney was born! With backgrounds in fashion and product design, as well as a shared passion for interiors, Javvy and Frieda set out to bring their fabulous designs to the world in wallpapers, upholstery, clothes, home goods – if it could have a pattern on it, they made it. 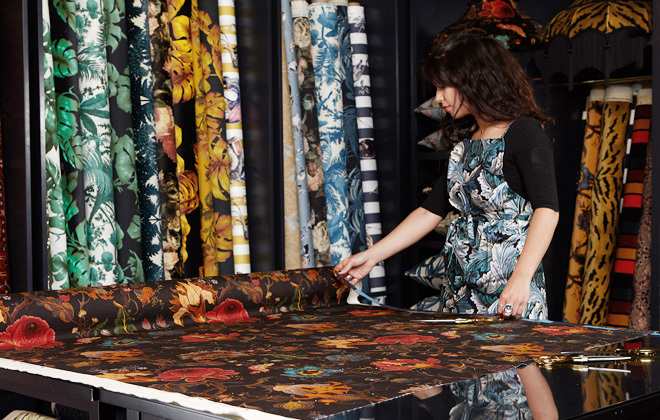 But House of Hackney doesn’t just talk the talk when it comes to British heritage-inspired goods, they also walk the walk by producing almost everything they design in the UK. 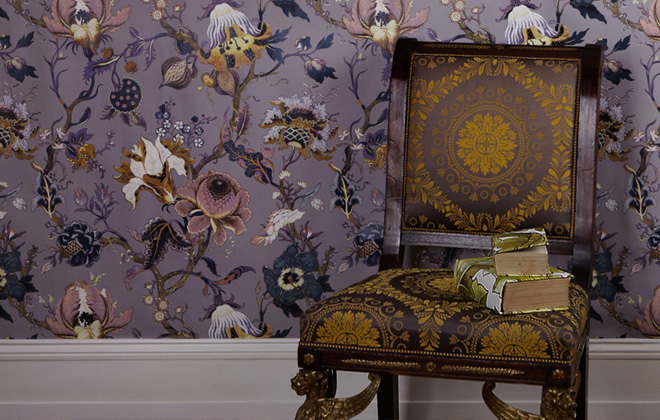 Their now iconic wallpapers are made in Loughborough, and the textiles are produced in Lancaster using only British velvets. All of their furniture is handcrafted in Nottingham, and the cookware line is produced in Stoke-On-Trent (arguably the “home of fine bone china” as they say). About the only thing not produced in the UK is the imported Italian silks – but we’ll give them that! In this way, House of Hackney truly is able to support local artisans, while keeping the rich legacy of British production alive. These days you can find House of Hackney in a new home in the hip London neighborhood of Shoreditch, where the amazing 2000 square foot town house is filled top to bottom with prints, prints, and more prints! It is definitely a must see while in London. All photos courtesy of House of Hackney.